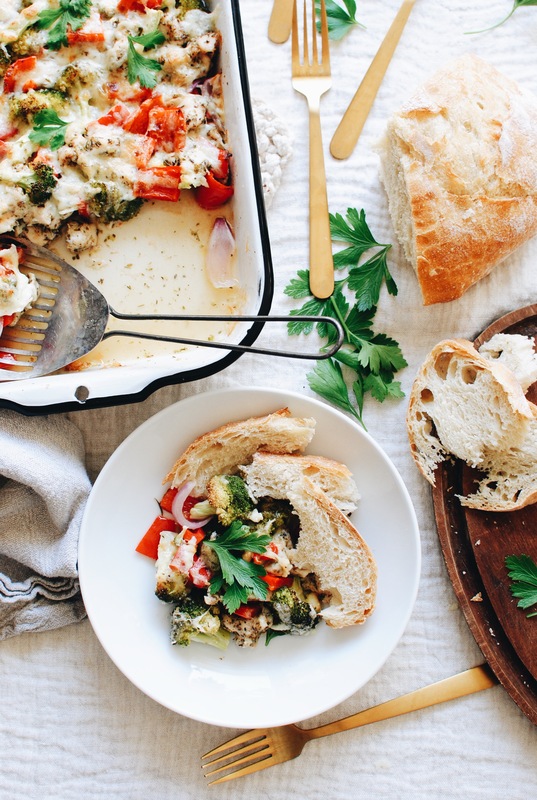 This might be one of my MOST-FAVORITE one pan bakes ever. And I mean ever. Evereverever. Because I mean, that cheese. Look at that cheese. You’d never guess what kind of cheese it is! How about, HAVARTI. Didn’t see that coming, did you? That’s how I do. All the surprises. First of all, this recipe takes like, 10 minutes to pull together. You dice chicken, you cut up a bell, you hack into a pepper, and you rip up some broccoli. And it feels really good. The PIZAZZ (<–why) comes from this tasty little concoction you just whipped together, with dried Italian seasoning, olive oil, garlic and onion powder, and a pinch of salt and pepper. It’s this magical combo that takes plain ol’ chicken and veggies and makes it ORBITALLY RIDIC. I’m getting a giant squiggly line under both of those words, but I’m so giddy about this I don’t even care. You’ll toss the diced chicken in the Italian sauce mix thingy. And we won’t discuss how many food blog rules I’m breaking right now showing you raw chicken. That’s how I do. All the rule breaking. All the surprises and the rule breaking. 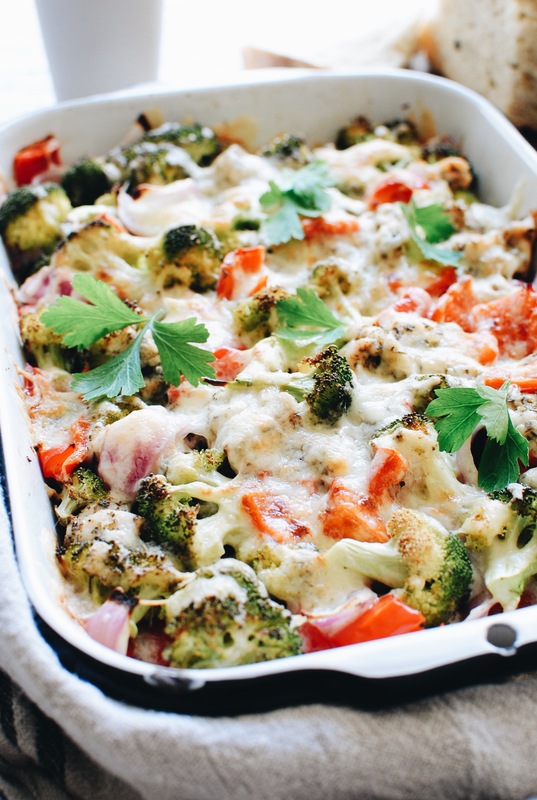 Theeen nestle the chicken and veggieroos in a casserole dish and try and get a little bit of that Italian sauce mix thingy on the veggies! Just a little smooch here and there. No bigs. It’s so simple but GIANT in flavor. That Havarti, man, with its buttery yet acidic tones just MAKES this meal surprisingly scrumptious. Especially all kissy kissy with that Italian sauce mix thingy. I’m like, salivating just remembering the memories. Which is redundant. Never mind. It’s kid-friendly, it’s weeknight-friendly, it’s waistline-friendly, and it’s tongue-party-town-friendly. 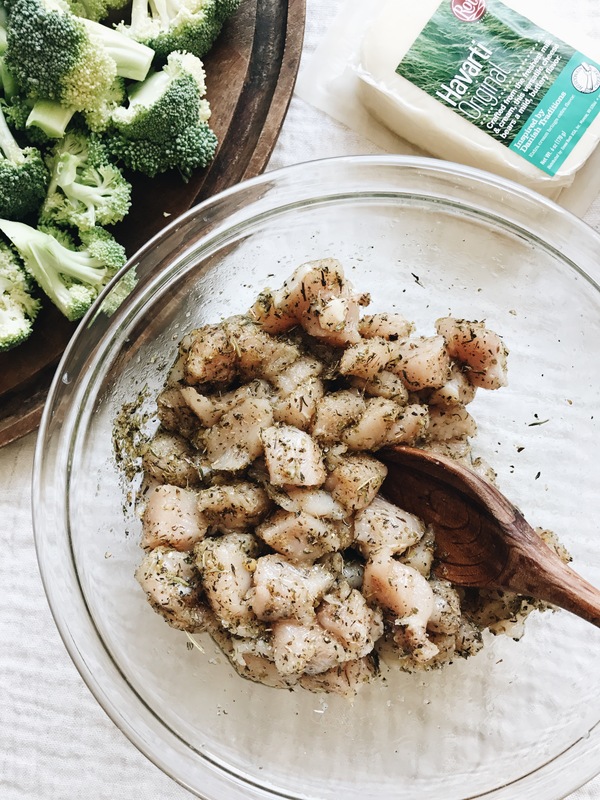 In a small bowl, combine the Italian seasoning, oil, garlic powder, onion powder, salt and pepper. Stir until incorporated. In a large bowl, toss the diced chicken with the Italian sauce. In a casserole dish (8x11 works! ), arrange the chicken and veggies. 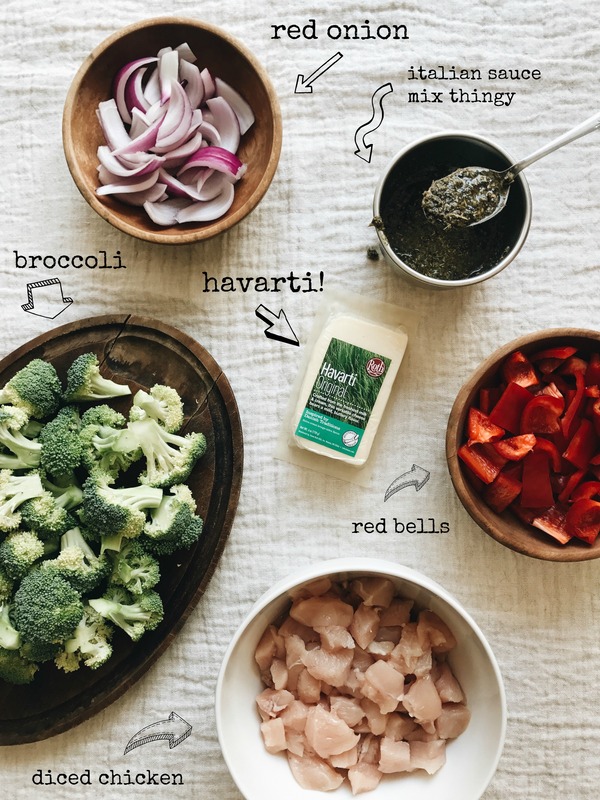 Using your fingers, nestle everything together, to where the sauce rubs off on some of the veggies. 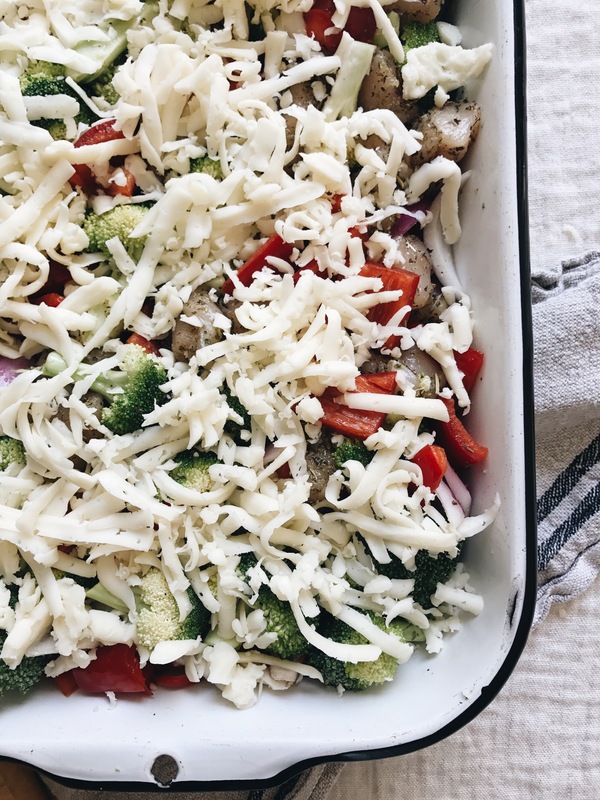 Sprinkle the cheese over the chicken and veggies, and bake for 30 - 40 minutes, until the chicken is cooked through, the veggies are tender and the cheese is browned and bubbly. Garnish with parsley and get that IN YOUR MOUTH ALREADY. I went to my local meat market last weekend and had them make me a bologna sandwich with havarti dill, OMG. It is my all time favorite cheese. Thank you for an easy but stellar weeknight meal! This looks delicious! Thanks for the recipe :) I'm going to try it tomorrow!! Well thank you so much, Elizabeth! First off, is that a fish spatula? I use mine for EVERYTHING too! Secondly, we coo. Any chance you think this would freeze okay? 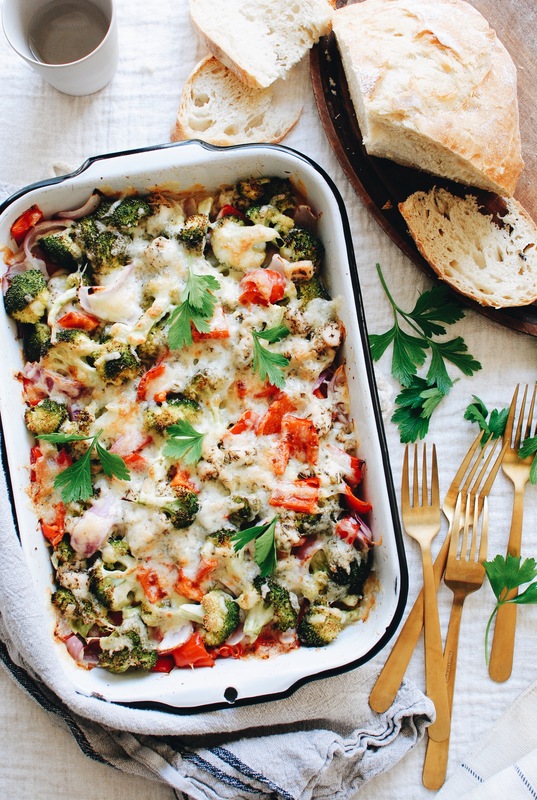 I've got a baby coming and this looks like an awesome make ahead and throw in the freezer dish! First time to your site and I'm loving it so far! I'm guessing that almost four hours might be a little bit too long. ;) Looks delicious. I love havarti. Bev, Thanks for the recipe. I made it tonight for the fam and it was a big hit:) My husband requested it be put in the rotation. I've made this twice. 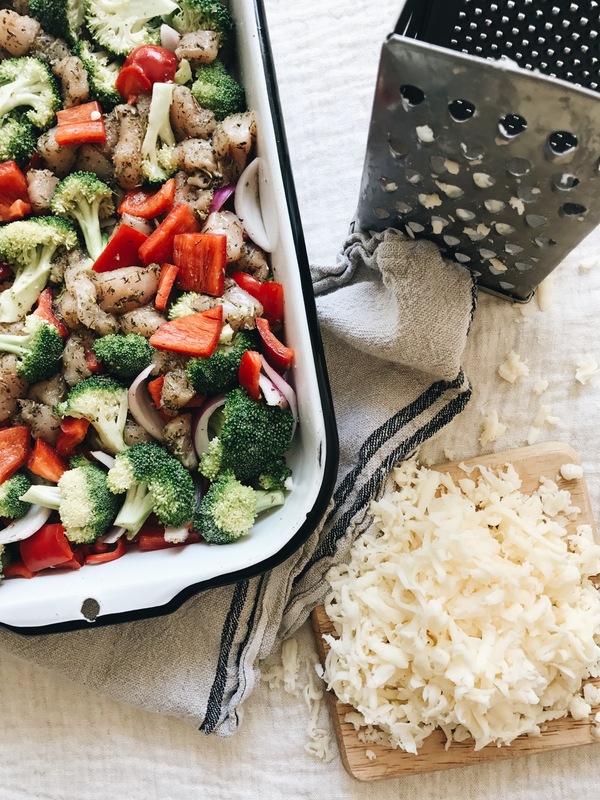 It's very flavorful with that Italian seasoning and very comforting and satisfying with all that cheese but it's not too heavy. Love this recipe! 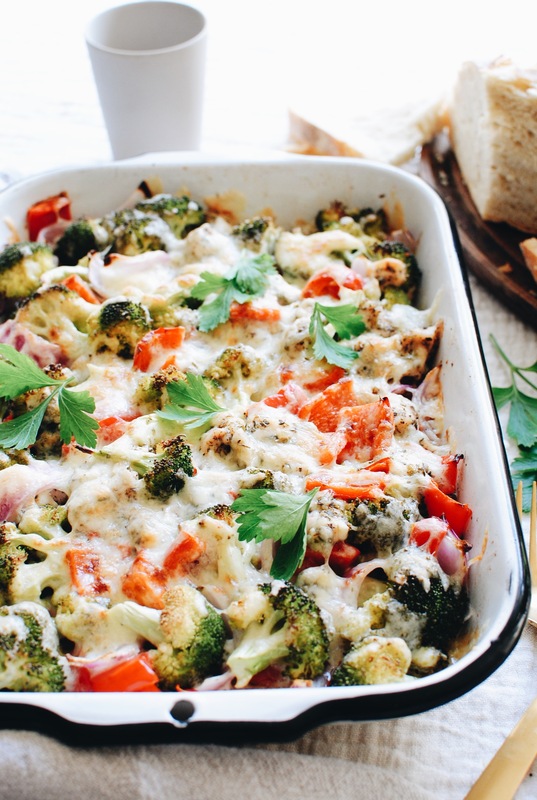 Just had to post again about this recipe, because I made it this evening after a day of working, a sick kid, groceries, kid pick ups and drop offs and pick ups again...This is one of my go-to weeknight meals. Almost as easy as ordering pizza and a lot more healthy. Love it! Such a simple dish, but what great flavors! Thanks for the recipe! 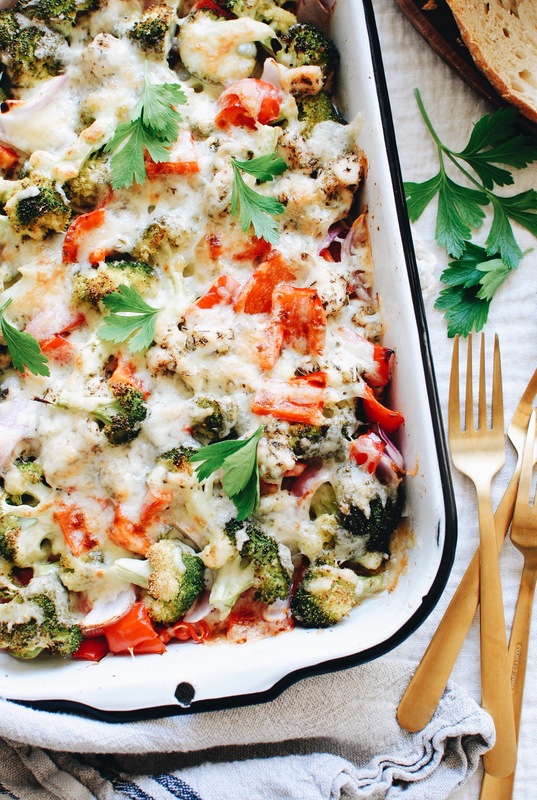 This came together quickly for a weeknight dinner and it's healthy! How do you reheat this?